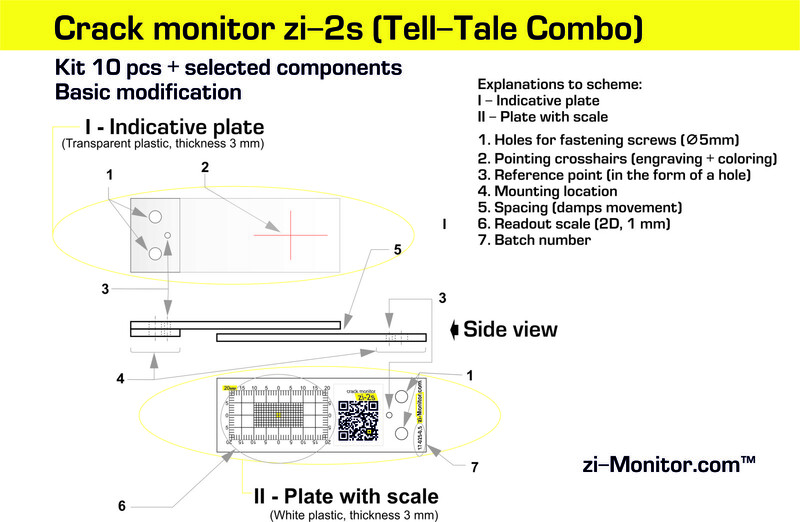 Today we represent a new universal model of crack monitor zi-2s. It has a large quantity of modifications, available for order. It allows choosing exact construction of crack monitor in accordance with particular demands of a buyer. 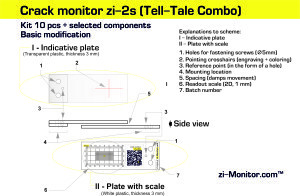 Crack monitor zi-2s has eight modifications and eight additional components, which are available for purchasing if necessary. We decided that specialists know what crack monitor they need for particular cases. They have a right to choose necessary supplements and tools, and they can reject unnecessary ones. We have developed special changeable model of crack monitor. Despite variety of possibilities, term of making (delivery) of order is from 1 to 3 work days from the moment of payment receipt. All proposed modifications and supplements are in stock. The only thing that can delay shipping is a process of agreement of a model with a buyer, if the buyer orders crack monitor with placing of his/her information (with branding). We think that crack monitor zi-2s will be necessary for professional buyers, related to control of building and constructions technical condition. Crack monitor zi-2s is available in our Internet store or on site eBay. You can also demand invoice for payment through PayPal, or from bank account. To make this just send a request on email. If you have any questions, we are ready to answer in comments or by email. We tend to long-term and profitable cooperation with our clients. This entry was posted in News and tagged crack monitor, crack monitor zi, news, zi-2s. Bookmark the permalink.